Board your overnight flight to Paris, France. Explore Normandy on a full day excursion. View the Gros Horloge, Rouen’s astronomical clock. Tour Auvers-sur-Oise, inspiration for many of Van Gogh’s paintings and masterpieces. Immerse yourself in French culture and Parisian romance on a tranquil 7-night river cruise through the resplendent Normandy region. Start your journey in Paris, the “City of Light.” Tour Auvers-sur-Oise, the former home of several painters including Cézanne and Van Gogh. Coast past the idyllic French countryside and dock in Rouen, where you’ll see the Gros Horloge astronomical clock. Stop in Le Havre and explore Honfleur. Visit Château Gaillard, constructed by Richard the Lionheart in the 12th century. See the gardens of Giverny, the home and inspiration of the Impressionist painter Claude Monet. 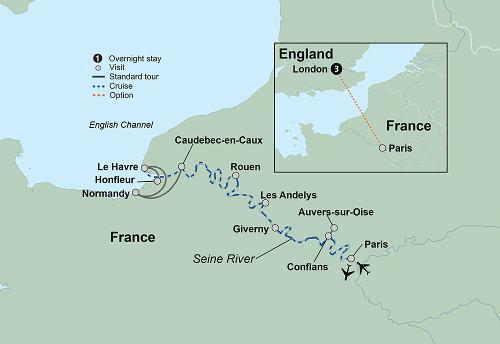 This is La Belle Seine – a journey as elegant as France itself.